Hawkesbury's Bernie Kelly clinched the biggest win of his training career when Bobbing brilliantly won Saturday’s $150,000 final of the inaugural Sky Racing Spring Provincial Series at Kembla Grange. But his fellow provincial trainers can breathe a sigh of relief ... Bobbing won’t be attempting a repeat performance in next autumn’s Provincial Championships. Kelly and his wife Anne have sold their North Richmond property and are moving to Scone in the coming weeks. That means the talented five-year-old will not be eligible to contest the 2019 Provincial Championships and, under the conditions, it appears the Country Championships equivalent either. The finals of both rich series are run on consecutive Saturdays (Country April 6 and Provincial April 13) during The Championships at Royal Randwick. With Rory Hutchings aboard, Bobbing ($4.80 favourite) produced what has become a trademark overpowering finish to easily defeat Newcastle pair Plaisir ($6) and High Power ($15) in the 1600m final. He is building an impressive record, having now won four of his only eight starts, and finished second on three other occasions. Kelly, a son of the late Noel Kelly, the Ballarat trainer who was regarded as one of the most astute of his time (he nearly brought off the Randwick spring feature double in 1974, landing the Epsom with roughie Citadel before Frozen Section was nabbed on the post by Passetreul two days later in The Metropolitan), never has more than a few horses in work. He has done a splendid job with Bobbing, whom he and his wife Ann bred. Bobbing is by the deceased stallion Beneteau (by Redoute’s Choice) from the Dehere mare My Dear, who provided Kelly with his last city winner at Canterbury on New Year’s Eve 2003. Beneteau, placed behind Star Witness in the 2010 Group 1 Blue Diamond Stakes at Caulfield, sired only two crops at Arrowfield Stud before his untimely death in January 2013. Bobbing was a late foal, born on November 24, 2013: “We foaled him down at home around 3am that morning,” Kelly said. There was also extra significance in his birth. My Dear’s previous two foals (colts by Nicconi and Beneteau) both never had the chance to make it to the races (one died from a foreign disease and the other from a severe bout of colic). It hasn’t been plain sailing for Kelly with Bobbing, either. He did not begin racing until a late three-year-old when runner-up on his home track on May 19 last year. “A few things went wrong with him, including a fractured splint bone,” Kelly said. “But he has certainly been worth persevering with. Kelly said he took no credit for skilfully planning Bobbing’s successful path to becoming the inaugural Spring Provincial Series winner: “I honestly didn’t know about the series until I was scanning through the calendar and saw these races and thought he would be suited,” he said. Kelly and his wife Anne race Bobbing with former Sydney Turf Club director Judy Foley, Robyn Sperling (wife of another former STC director Evan Sperling) and Sydney anaesthetist Michael Gleeson. A Hawkesbury double at the Kembla meeting seemed certain when husband and wife training partnership Mitch and Desiree Kearney “won” the next race, the 1600m Maiden Handicap with Jonjo’s Comet ($6). However, stewards subsequently relegated the gelding to second, agreeing with connections of runner-up I Arize ($3.30) that there had been sufficient interference over the last 75m to reverse the result. Leading trainer Brad Widdup notched his 16th winner of the season when lightly-raced three-year-old Sizzled ($1.45 fav) broke through at Newcastle on Sunday in the Provincial & Country Maiden Plate (1300m). Having his first start since early August and only the fourth of his career, Sizzled overcame a wide run and was the second of jockey Corey Brown’s four winners at the meeting. 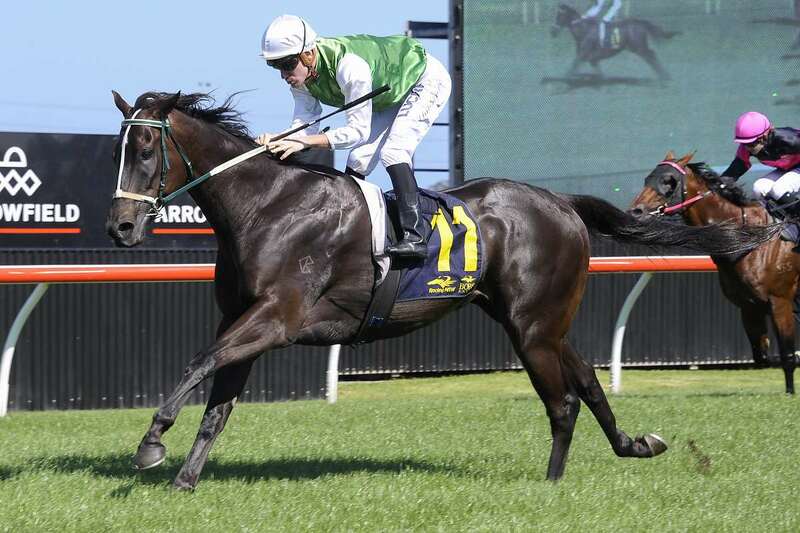 Managing part-owner Damion Flower races the Sizzling colt in partnership with a group which includes Channel 9 rugby league commentator and former successful coach Phil Gould.